Meet Le Cordon Bleu Ottawa Diplôme de Pâtisserie student, Elina Olefirenko. Originally from the Ukraine, Elina first moved to Canada to study Business Management, Hospitality in Vancouver before pursuing her passion for pastry at Le Cordon Bleu Ottawa. Elina is hard working, dedicated and certainly creative when it comes to pastry, and like many of our students she placed her future in her own hands and decided to follow her passion “10 years of patience, hard work and being stubborn brought me here, exactly where I’m supposed to be" said Elina. We chatted with Elina to figure out how she went from a Business Management in Hospitality degree to studying the Diplôme de Pâtisserie full time and working at Italian Artisan gelato cafe, Mantovani 1946. When did you realize you wanted to study culinary arts and become a pastry chef? I’ve always been an artistic person, but for many years I had doubts on how to turn my true passion into a full time career as a professional pastry chef. My first experience in the kitchen was 10 years ago during my university practice as part of my business management in hospitality degree. I had a chance to spend 4 months in a high-end restaurant kitchen and I knew then I was in the right place. Pastry has always been a big part of my life all the way up till the day I enrolled at Le Cordon Bleu. While studying in Vancouver all my projects were related to the restaurant business. I also worked for a year as a pastry maker in an Italian restaurant, this helped me realize that I want to become a pastry chef. 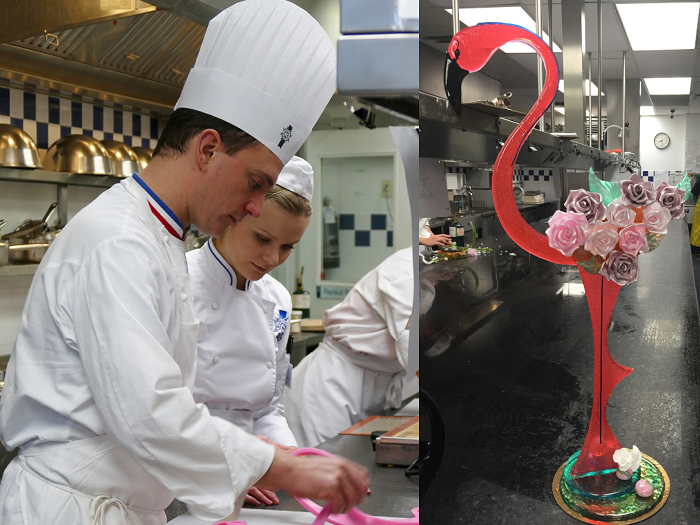 What made you decide to study at Le Cordon Bleu Ottawa campus? The main reason for choosing to study at Le Cordon Bleu was the practical hands-on approach and experience, also the reputation of Le Cordon Bleu around the globe precedes itself, it was my only choice. What has been one of the most important things you learnt so far while studying to become a professional pastry chef? You need to have a complete dedication, as they say ‘if you give 100% of input you receive 100% of output’. Hard work is the key to success but you also need to have a creative side and vision that objectively relates to the industry especially in pastry, as it’s an art. You also need to be tough on yourself and realistically judgmental, that’s how you grow into a professional. I have grown professionally as a student under the guidance of my Superior Pastry Chef. I understand and share his infinite artistic vision, teaching approach, his goals to help us constantly progress, and thrive to be the best and never accept average quality. I am impressed and inspired by his professionalism, diligence and passion for pastry and I genuinely respect his path of hard work in reaching his goals. What's your all-time favourite dessert or pastry? My favourite pastry is probably Ukrainian Honey Walnut Cake with sour cherries and our own type of marshmallow which we call Zephyr (that’s the dessert from Soviet Union, very light and originally is made on the base of apple puree). You are working at Mantovani 1946 while studying, how has your experience been so far? I’m trying to push beyond my own limits, so working at Mantovani 1946 while studying is challenging, especially being the only pastry person there, but I love to keep myself busy and I’m grateful for a chance to have a total freedom in developing their pastry menu (even some gelato flavours!). Mantovani 1946 has also given me the opportunity to implement my ideas, experimenting with new techniques I’ve learnt in my studies. The most rewarding part of my job, is seeing people scrape every bit of dessert off their plates! My short term plans are to get more practical experience, fully immerse myself in the industry, both in hotels and high pace restaurant environments. My long term goal is to one day combine my gained knowledge and experience from both business and pastry and become a pastry chef instructor. I would like to create my own programs and teach short 2-3 days’ intense hands-on classes. Be sure about what you want to do in your life, if you are not sure, don’t start or continue because you will never devote 100% of your energy and passion. Once you’re sure, pursue your goal, be stubborn in a good way and always demand more from yourself. Absorb all techniques from your chef instructors, but also work on your own style. Always learn and grow, never stop.